Page Master Designs Online: What's Brewing? Good Morning! I always love to start my day with a cup of coffee....ok who am I kidding? I drink coffee ALL DAY. It's my favorite drink. So when I saw this set from Simon Says Stamp I was beyond thrilled. It came in my monthly card kit. 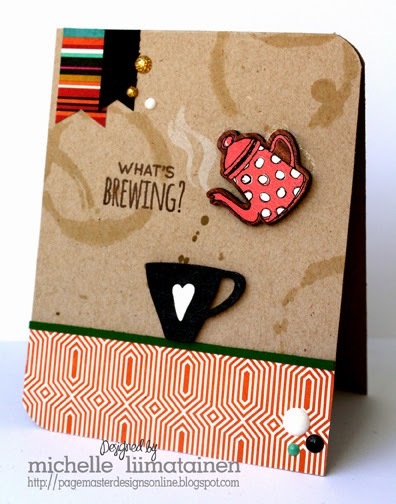 I was all set to use just the elements from the kit when I saw THIS post on the Simon Says Stamp Blog. It's the "Work It Wednesday" post for September and this month Shari Carroll came up with a really great color scheme. I loved it so much that I "made it work" with the October Card Kit. I used a Tim Holtz stencil for the coffee stains in the background. Everything else (except the green paper) came from the October Kit. So cute, Michelle! I love the "stains" in the background.